We are sad to announce that Joyce Morganfield passed away on March 13, 2013. Joyce joined Nicki's Circle Central at St. John's Cathedral in November of 2010 and visited occasionally. She always had a bright and happy smile. We will remember Joyce with love. Joyce Ann Morganfield, age 61, of Golden, Colorado, passed away on Wednesday, March 13, 2013. She was born to George and Mildred Cochran on August 1, 1951. Joyce attended South High School, before attending Colorado State University. Joyce married Steve on September 30, 1978. She worked for Forest Oil and began her own travel agency that allowed her to work to work in the area of travel, which she loved so much. She was a dedicated volunteer. She dedicated her time and passion to raising money for the Ovarian Cancer Research Foundation and Golden Retriever Rescue. 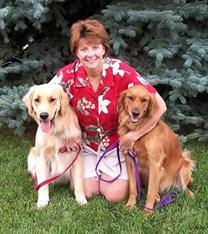 Family, friends and her beloved dogs were Joyce's passion and delight. Joyce loved spending time with friends. She entertained frequently and was known as a gracious host. She loved to travel and was able to go to all corners of the world. Most recent a dream trip to see the polar bears. Joyce loved an adventure and was always willing to try something new. She was an avid water and snow skier. She participated in a triathlon and would kayak, zip line or scuba at a moment's notice. Joyce will be deeply missed by all. She was a truly special person who lived every moment and fought till the end. A celebration of Joyce's life will be held on March 22,2013 at Crown Hill Cemetery 5:00 p.m. Donations in honor of Joyce can be made to the Ovarian Cancer Research Foundation or to Golden Retriever Rescue.